Read the original review on observer.com. Rex Reed describes his own review of The Shape of Water as going "out on a limb with a saw in [his] hand." Well, I'm here with a mechanical fruit picker to shake the tree and make sure he falls. This collection of factural errors masquerading as a review describes enough of the movie to ruin any suspense, but gets so much wrong that he can't have been truly watching. Sally Hawkins' character Elisa's face was not, in fact "burned into scar tissue," nor was she "mentally handicapped." He even got the name of the director wrong, crediting recent Star Wars actor Benicio del Toro with the film rather than Guillermo, and said he was from Spain, which neither del Toro is. It has since been corrected after widespread ridicule, but the internet remembers all. There's no excuse for that kind of rookie mistake in 2017, you should be copy/pasting just for the spelling alone (which he also fucked up--it's Elisa with an S). Hell, if you're feeling fancy you could auto-populate your review template with IMDB data like a falsity contraceptive, although obviously this wouldn't have prevented all the other errors of fact or understanding. It should also be noted that while they updated the review to correct the country and removed the part where he claimed Hawkins' character was mentally handicapped, only the name change is acknowledged in the correction note. I guess it's a little harder to explain how you got basic facts wrong that are explained in the movie he supposedly watched, and the Observer would rather pretend their star reviewer isn't going senile. Despite acknowledging the obvious themes of the movie, Reed just can't seem to wrap his head around it. "Alas" he sighs, "the more I try to find some kind of justifiable meaning and relevance, the more I find The Shape of Water a loopy, lunkheaded load of drivel. Not as stupid and pointless as that other critically overrated piece of junk Get Out, but determined to go down trying." Oh, he's racist! That explains why he can't tell latinos apart, and also doesn't like a story about amphibious miscegenation. There are only two reasons anyone could hate Get Out, either your favourite movie is Cars 3, or else you were cheering for the Armitage family. Reading this review, it's difficult to decide whether Reed is bigoted or merely stupid. But why choose? As that guy in the White House likes to remind us daily, a white man in his 70s can certainly be both. The thing about this movie is that it's not subtle. The main character has a speech where she spells out exactly why she's attracted to the fish-man, and there's a scene where a black couple literally isn't allowed to sit in a diner. To miss the point of something this heavy-handed requires obliviousness bordering on willful denial. Or maybe it isn't so much that he missed the point as rejected it. This movie and Get Out are both about groups who are systemically marginalized by society: black people, disabled people, and fish people. Reed repeatedly brings up the fact Elisa cleans toilets and even calls her "pathetic" and "defective," so it's pretty safe to assume he didn't do much empathizing with the film's protagonist. A man who's been paid to watch movies his whole life probably has some serious mental blocks around privilege and the struggles of the "under-classes." It's something of a miracle that despite this review obviously never being run past an editor, it didn't include phrases like "those sorts of people" and "the help." However, mere prejudice cannot explain all of the things Reed gets wrong in this review. For example, he says the movie has "villains from Central Casting, including the Russians" and later claims Elisa attempts her rescue "knowing the unfortunate fish man faces extinction at the hands of the Kremlin." This is a complete fabrication--whether the Russians are villains at all is open to debate, and in any case Elisa doesn't know about them. It's difficult to guess which parts of the movie went over his head. Did he miss all the parts where the Americans were torturing the piscine love interest? Was he confused about which of the many white guys was the Soviet agent? Or maybe, like Jen Kirkman and the DNC, he labels everybody he doesn't like as a Russian operative. Reed is probably right that Benicio del Toro's story of a mentally handicapped woman saving a monster from the Kremlin is pretty bad. Fortunately for us, nobody but him had to watch that movie. But just when you think the review is mercifully about to end, there's a massive spoiler for the climax of the movie, like the last petulent stomp of a toddler whose tantrum has not produced an ice cream cone. 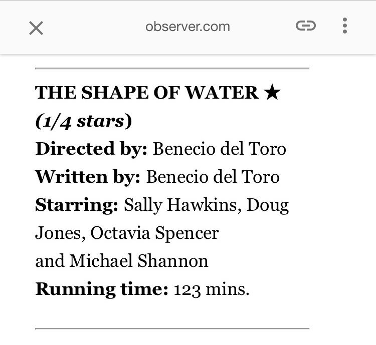 The question raised by Reed's review of The Shape of Water: an old man may stare at a movie, but did he really watch? Like colours, we can never truly know what another person sees. You know what I say, one man's "got fired by the Observer in May" is another man's "never should've been hired back in any capacity, except maybe to clean the toilets."